Do You Need Us as Soon as Possible? We work on a first-come-first-serve basis. If you have gophers, don't wait until your garden or plants are already damaged. While moles are not after your plants, they also cause serious damage. If you notice a mound in your yard, take action. It will not go away! If the mound is half-moon shaped, with a plug, then you're looking at a gopher mound. If you're looking at a series of small dirt volcanoes and possibly surface tunnels along boarders, then you're looking at a mole. It is important to know which pest you have before you call us, so please go to Pest ID for a more detailed explanation for identifying your pest. If you're outside of the Sonoma County area and need assistance with your farm, ranch, park, or other properties, let us know. We have traveled many times and assisted others in learning how to trap gophers on their property. Contact us for prices and availability. We offer two services. We can teach you how to trap or we can do the trapping for you. Want to learn? We drive out to your property, spend 1 ½ hours teaching you how to trap, give you 4 traps and a special digging tool. Trapping is a skill. Once you learn. It is easy. However, if you are squeamish or dont want to be bothered, let us take care of your pest problem. We will come out for three visits. On your first visit, we will set as many traps as possible on your property. On public access property, we stay on site with the traps set in the ground. On private lands, we leave the set traps in the ground over night. The second visit, we recheck all the set traps and reset any that have been sprung or backfilled. We pull the traps that have caught a gopher and leave the tunnel open. The third visit, pull our traps and refill any intrusion we made on your property. 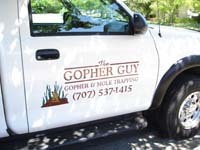 By quickly trapping the gophers on your property, you will be able to relax and enjoy your surroundings once again. We provide our trapping services throughout Northern California, but concentrate on Sonoma County. We do have out-of-area rates for traveling expenses but we are fair. If you're outside of Sonoma County, we will need to schedule you an appointment at least a 3-weeks in advance. We can work with you and discuss with you your options. 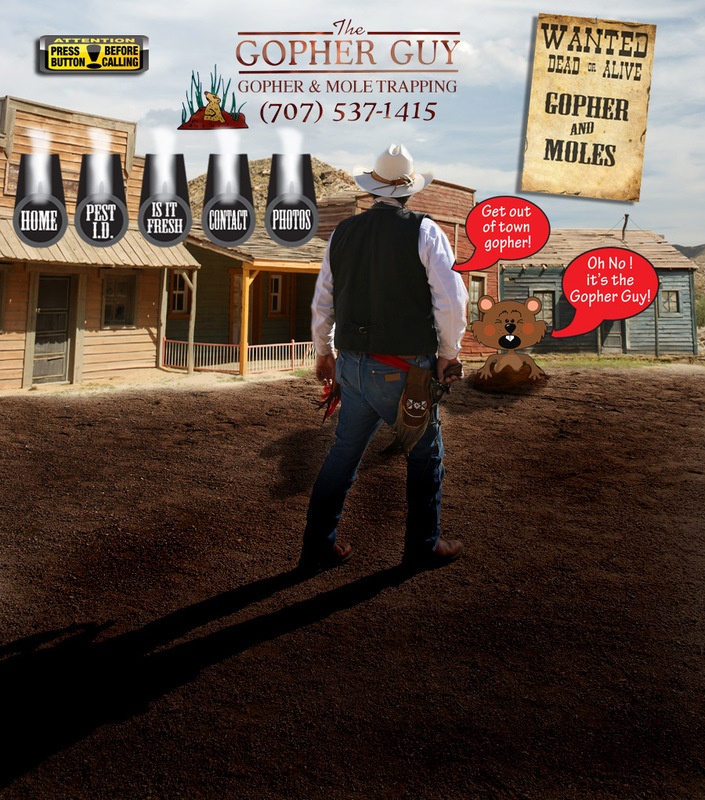 © Copyright 2012 The Gopher Guy. All Rights Reserved.